Who says there’s no place like home for the holidays? As far as we’re concerned, Christmas can be just as fun on a massage table, poolside or in a luxurious suite at the Scottsdale Fairmont. Between the Christmas at The Fairmont festival taking place through January 6, unbelievable seasonal decor, restaurant offerings and holiday packages, The Fairmont Scottsdale turns into a veritable winter wonderland in December. Here’s what the resort has in store for this season for guests and Valley residents (the grounds are open to the public!). You’re hard-pressed to find many four-story musical trees in the Valley! The Scottsdale Fairmont has just that. 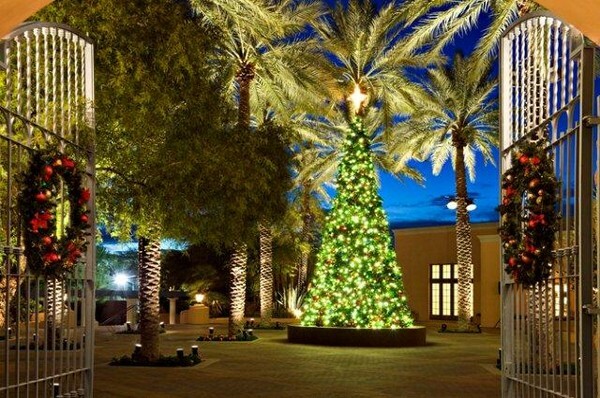 Designed for the resort, the tree features 65,000 LED lights that dance to 10 holiday songs. The light and music show runs between 6 and 10 p.m. this month, playing approximately every 10 minutes. During the day, the tree is still dazzling visually, with dozens of glistening snowflakes and a 5-foot snowflake tree topper. Frost yourself! The Fairmont Scottsdale Princess is putting extra icing on the holidays with the Desert Ice Holiday Rink located in the Cactus Garden. The all-new 5,400 sq.-ft. ice rink (real ice!) is open daily to the public. The price is $15 for adults, $10 for children 12 years and under and $5 for skate rental. A portion of proceeds will benefit the Phoenix Children’s Hospital. The rink is open between November 27, 2012 and January 6, 2013. Sunday through Thursday, stop by between 2 p.m. – 5 p.m. & 6 p.m. – 9 p.m. Friday & Saturday, visit between 2 p.m. – 5 p.m. & 7 p.m. – 10 p.m. 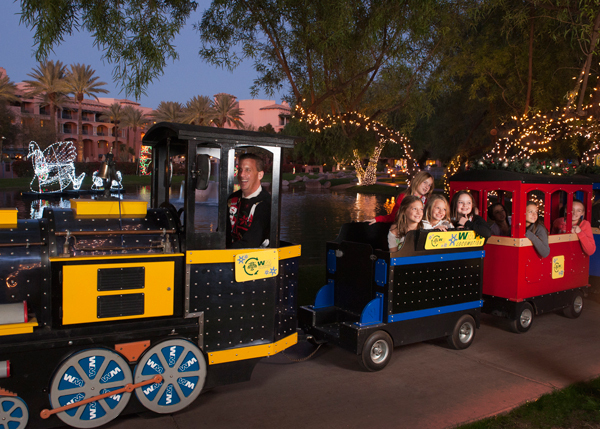 The WMPO Princess Express, an electric train sponsored by Waste Management Phoenix Open. Guests of all ages can enjoy a complimentary ride on Friday and Saturday nights around the lagoons. Guests will enjoy the beauty of four natural green trees in the main lobby, embellished with decor that captures the heritage of the Southwest. Angel statues of hammered silver, wreaths, swags and candles will also illuminate the lobby, in addition to a seven-foot gingerbread nutcracker and gingerbread sleigh. 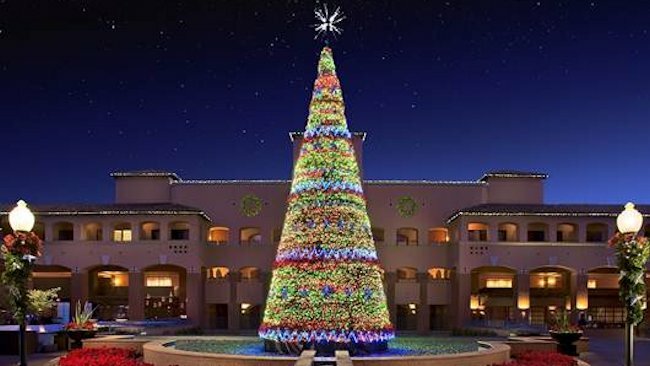 A 25-foot fiesta tree will also adorn La Hacienda Plaza near Willow Stream Spa, with music filling the air with the sounds of the season. Friday and Saturday nights through December 24, Santa can be met in the Princess Lobby between 5:30 p.m. and 8:30 p.m. The young and young-at-heart can take a photo with Santa for $10. If guests dine in any of the restaurants, including BOURBON STEAK, La Hacienda, The Grill or LV Bistro, photos are complimentary. All pictures are available for immediate pick-up in the resort’s new Holiday Shop. Sing along with a group of carolers will stroll the resort between 6 p.m. and 9 p.m., Friday and Saturday nights through Christmas Eve. A nightly menorah lighting, complete with applesauce and latkes, will take place in the resort lobby through Hanukkah, December 8-16. Other holiday activities include marshmallow roasts, stocking decorating and dreidel-making for the kids at Bobcat Billy’s Clubhouse. Holiday resort activities for locals and hotel guests vary, so call for details! The Holiday Shoppe, located just off the lobby, and is open until 8 p.m. each night, and offers a variety of themed ornaments, menorahs, dreidels, toys, holiday gifts and more. Shipping is free in the U.S. for all purchases over $250 and gift wrapping is complimentary. Near the ice skating rink is a new shop, The Igloo, which offers wintery wear like hats and gloves, holiday décor, glow sticks, blinking novelty items and gourmet holiday chocolates. Drop-off toys for Toys for Tots through Dec. 21, on the front drive of the Fairmont. Don’t lift a finger this Christmas! Make reservations at the Palomino Ballroom this Christmas morning for the ultimate brunch experience. Seatings are from 10 a.m. – 2 p.m. are $75 for Adults, Half Price for Children 6-12 and Children 5 and under eat free with a paying adult. The full menu can be viewed here. For dinner, each of the resort’s signature restaurants have prepared spectacular prix-fixe holiday menus. Click here for full menus and pricing. The Sip, Savor & Celebrate package begins at $249 per night and includes a $100 daily credit to be applied toward dining, spa or tennis. For more on the Fairmont Scottsdale’s holiday packages including full terms and conditions, click here.